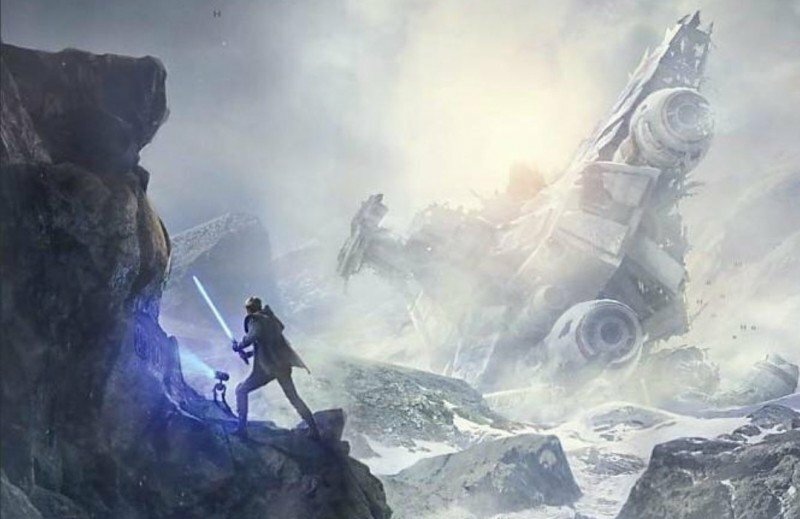 Our first look at Jedi: The Fallen Order concept art from Respawn has released, and we're poring over it for all the details. We're gearing up for Jedi: Fallen Order to make its official debut this Saturday, and latching on to just about any little tidbit of info we can get ahead of its announcement. That's why we're so excited to see this image Amazon has posted of the latest Star Wars game, which includes a T-shirt design with plenty of references to the game's poster. It looks like Amazon was a little hasty when putting the image of, but their loss is obviously our gain. There isn't a lot to see here in terms of juicy details, just mainly a lightsaber, some sort of wreckage of a starship, and a Jedi, of course. There's a tiny droid, and a sense of tension in the image. But that's about all we can parse right now. Of course, this isn't anything like the final look at the game and may not even be what we see this weekend. The first single-player Star Wars game we've seen in quite some time has us extremely excited, but we don't know what to expect other than it was created with Unreal Engine 4 instead of Frostbite, confirmed by EA's community manager via Reddit. It may be time to shift away from the Frostbite engine for a while, so this is good news. We don't now much else about the game, however, like if it will have a multiplayer mode, but we do know it mainly centers around a single-player action adventure campaign that takes place after the prequel films. Many fans felt burned by the Star Wars Battlefront 2 release and the loot box debacle that came with it. We've been practically begging for a new Knights of the Old Republic (or something like it) for years. We're optimistic for what we might see out of Respawn's stab at Star Wars, especially since they really killed it with Apex Legends. We'll keep you informed as more details slip out about Jedi: Fallen Order, so keep it locked here at Shacknews!